In The Migrant Image—winner of the prestigious 2014 College Art Association Frank Jewett Mather Award for Art Criticism—T. J. Demos examines the ways contemporary artists have reinvented documentary practices in their representations of mobile lives: refugees, migrants, the stateless, and the politically dispossessed. 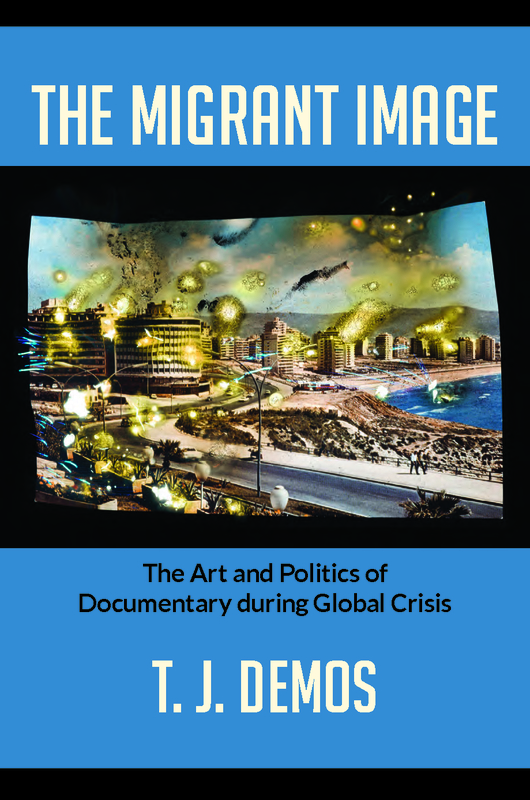 He presents a sophisticated analysis of how artists from the United States, Europe, North Africa, and the Middle East depict the often ignored effects of globalization and the ways their works connect viewers to the lived experiences of political and economic crisis. Demos investigates the cinematic approaches Steve McQueen, the Otolith Group, and Hito Steyerl employ to blur the real and imaginary in their films confronting geopolitical conflicts between North and South. He analyzes how Emily Jacir and Ahlam Shibli use blurs, lacuna, and blind spots in their photographs, performances, and conceptual strategies to directly address the dire circumstances of dislocated Palestinian people. He discusses the disparate interventions of Walid Raad in Lebanon, Ursula Biemann in North Africa, and Ayreen Anastas and Rene Gabri in the United States, and traces how their works offer images of conflict as much as a conflict of images. Throughout Demos shows the ways these artists creatively propose new possibilities for a politics of equality, social justice, and historical consciousness from within the aesthetic domain.